The Neuroscience of Dance – Integrating Science and Art – Coming Soon! This event will be open to the public and will be jointly hosted by the Center for the Neurobiology of Learning and Memory (CNLM), the Exercise Medicine and Sport Sciences Initiative (EMSSI) and the Claire Trevor School of Arts at the University of California, Irvine. Stay tuned for more information! 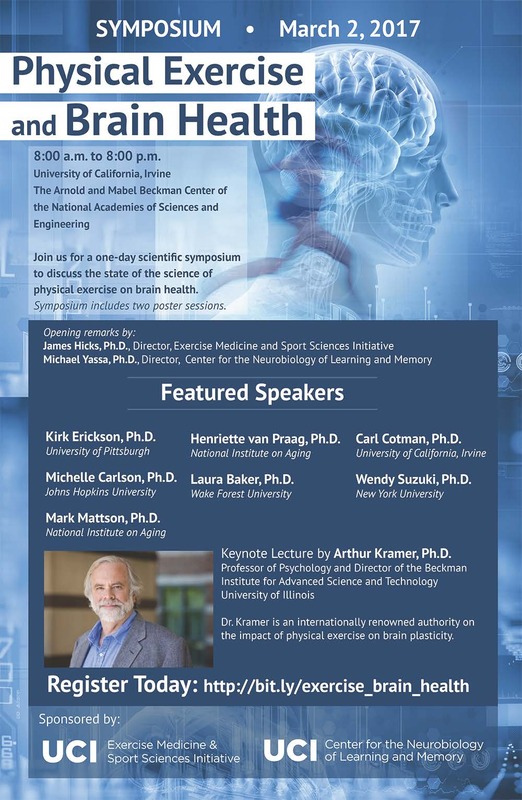 The Center for the Neurobiology of Learning and Memory and the Exercise Medicine and Sport Sciences Initiative at UC Irvine hosted a one-day scientific symposium focused on the link between physical exercise and brain health on March 2nd, 2017 at the Arnold and Mabel Beckman Center of the National Academies of Sciences and Engineering. Erik Erickson, Ph.D., Associate Professor of Psychology at the University of Pittsbugh, Pittsburgh PA.
Michelle Carlson, M.D., Associate Professor of Mental Health and Epidemiology at the Johns Hopkins School of Public Health in Baltimore, MD. Mark Mattson, Ph.D., Chief, Neuroscience Division, Intramural Research Program, National Institute on Aging, Baltimore, MD. Henriette van Praag, Ph.D., Chief, Neuroplasticity and Behavior Unit, Intramural Program, National Institute on Aging, Baltimore, MD. Laura Baker, Ph.D., Associate Professor of Internal Medicine, Neurology and Public Health, Wake Forest School of Medicine, Winston-Salem, NC. Carl Cotman, Ph.D., Professor of Neurobiology and Behavior and Neurology, University of California, Irvine, CA. Wendy Suzuki, Ph.D., Professor of Neural Science and Psychology in the Center for Neural Science at New York University, New York, NY. Arthur Kramer, Ph.D.Professor of Psychology and Director of the Beckman Institute for Advanced Science and Technology at the University of Illinois. The symposium also included a poster session, as well as an evening community lecture by Dr. Wendy Suzuki.